Te Wera is a great rock pyramid and the highest point of the Central Darrans. Gain the ridge from snow leads on the north west (Lake Turner) face. Scrambling, with a couple of steeper steps. 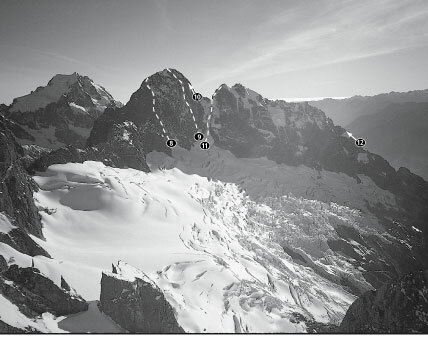 The first ascent party climbed from the Te Puoho Glacier via the cols below Te Wera’s south and west ridges. 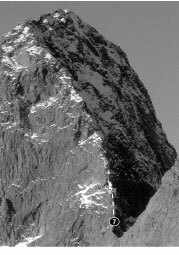 Full North Ridge (from col south of Pt 1969) climbed by James Speirs, Rich Turner, Dave Vass, February 2011. Ascend to the Col between Te Wera and Ngaitahu then easy scrambling along the broken ridge to the summit. Phil Houghton, Mike Gill, Feb 1959. The South Ridge might be a little loose in places, but it is steep, airy and exposed: a stone cold classic. Start from the col halfway along the ridge. Five ropes lengths on unstable and exposed rock, then scrambling to the summit. The first ascent party accessed the route from the Te Puoho via the col at the base of Te Wera’s south ridge, climbing the south ridge for 200m then dropping to snow fields under the south west face. Head up a scoop from Lake Turner to start at a notch in the West Ridge. Climb three pitches of 18 up the buttress and then scramble on loose blocks to the summit. Brigid Allan, Anna Gillooly, Feb 2001.